There used to be a brahmana named Shveta. He was a friend of the sage Goutama and had a hermitage on the banks of the Goutami Ganga. Shveta was also devoted to Shiva. In due course, Shiveta died and Yama’s messengers arrived to take Shveta to Yama. But they could not even enter Shiveta’s house. 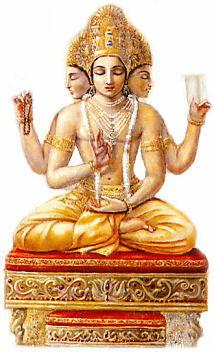 Finding that Yama’s messengers ere not returning, Yama’s companion Chitraka told Yama, “What do you think has happened? Why aren’t the messengers returning? Mrityu flung a noose to grasp Shveta’s body. But Shiva’s companion struck Mrityu with a rod and killed him. When the news of this was taken to Yama, he was furious. With all his companions he attacked Shveta’s house. Nandi, Ganesha, Kartikeya and several of Shiva’s companions came to fight on Shiva’s side, and a battle royal raged. All the gods arrived to mediate and end the strife. Things had a got a bit out of hand and Yama himself had been killed by Kartikeya. The problem seemed to defy solution. Yama was, after all, performing his duty. But Shiva insisted that his devotees would never be taken to Yama, but would instead go straight to heaven. Shiva’s condition was finally agreed to. Nandi brought water from the Goutami Ganga and sprinkled it on Yama and the others who had died in the fighting. They were all immediately brought back to life.